Fowler High Precision, (formerly called the Fred V. Fowler Company), is located in Newton, Massachusetts and founded by Fred Fowler in 1946. The Fowler Slogan: Fowler Tools and Instruments - A standard of quality and accuracy. Fowler has 2 product ranges: the first being high-end measuring equipment from the US and Europe: Bowers, Sylvac, Trimos, Wyler and several more. They also have an excellent economy line that is visible in the Fowler Tool-A-Thon. All Fowler products are on sale now! Gaging.com is Fowler factory certified. We carry all Fowler Tools! If you would like a quote or need help finding a Fowler Gage call (888)978-9873 or email us. 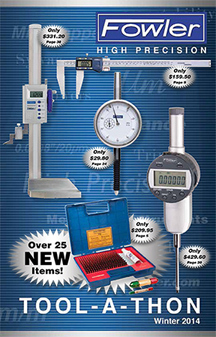 Fowler's new 54-188-777-0 improved 50 Taper Tool Presetter is on sale at Gaging.com! The TPR Series..